Greetings! 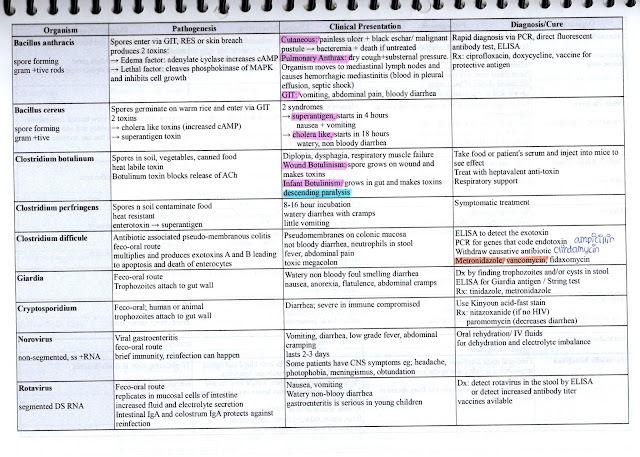 After the hit that was The Complete Guide to Pharmacology and it’s prequel The Complete Guide to Pathology, your favorite med student in the whole world is back again with a new post. It’s the same familiar format but a brand new subject. Yes. You read the title. It’s going to be Microbiology today. It’s one of those subjects that feels like a bizarre mix of pharmacology and pathology if you asked me. There is logic and structure to microbiology, but there is also memorization, although not at the same intensity as pharmacology. Nevertheless, it’s enough to make things a little daunting to the average med student. I know it’s still daunting to me. I may have gotten the microbes down, but the viruses still scare me quite a bit with their double strands and single strands and reverse transcriptases and shifts and drifts and yeah, I think you’ve got the idea. I’m also here to tell you that it’s okay! It’s perfectly fine to feel a little out of your depth. Isn’t that what med school, in it’s entirety, is all about? Fortunately, I am here to try to ease your fears. So let’s get started. Unfortunately, there aren’t as many resources that I can recommend as there were in the previous posts. I only used one textbook and had First Aid with me. What I can do, however, is walk you through the methods I used because I ended up making a specific set of notes that took me the entire year to properly craft. Let’s get started with some general resources that I used. 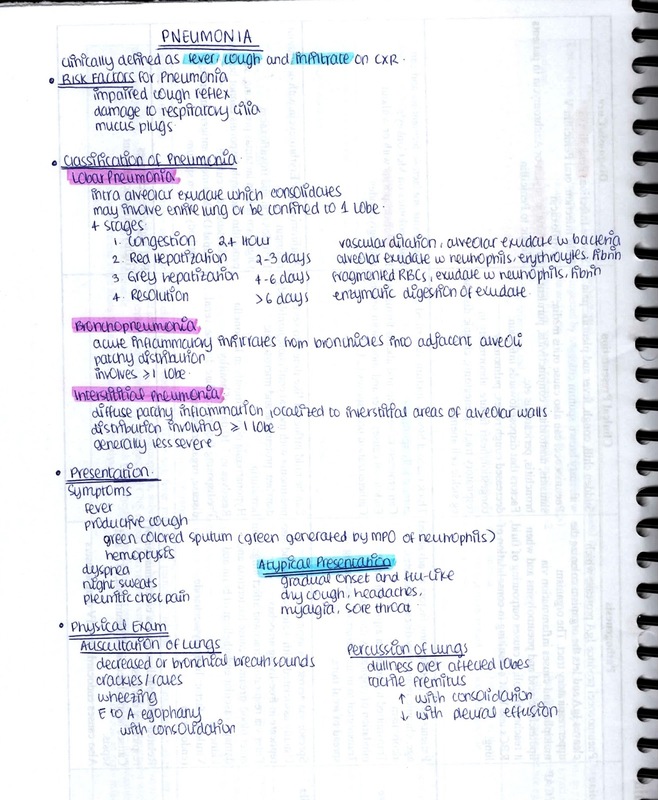 Review of Medical Microbiology and Immunology. Legitimately the only textbook I used when it came to microbiology, and only because it was required reading for the course. It’s a pretty good book, but you know what’s even better? The summary and questions and clinical pearls at the end. Those are fantastic and I kind of wanted to rip those pages out to add to my First Aid but that hasn’t happened (nor can it happen) because my First Aid is already too thick. 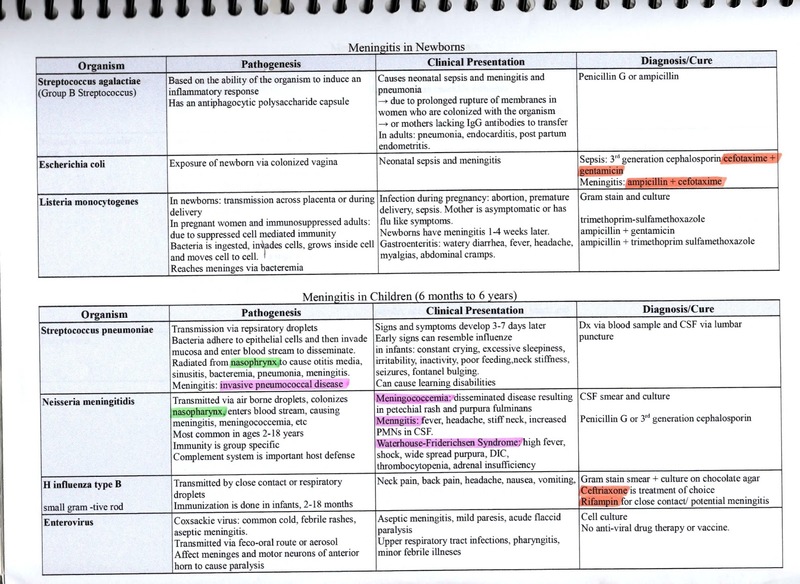 Some people used the Kaplan lecture notes for Microbiology. I personally didn’t ever use those lecture notes, nor did I hear anything outstanding about them. I did flip through the book and liked how everything was put into a table, which prompted me to make my own notes with tables as well. First Aid for the USMLE. Enough said. You must’ve gotten tired of me constantly saying this but it’s the TRUTH. Let First Aid guide you through everything you need to know. Not only will it tell you what’s the really important, relevant material but it will also get you familiar and comfortable with the book so that you can study for the USMLE if you do plan on giving it. Sketchy Micro. Sketchy is such an amazing resource, I’m quite surprised more people aren’t talking about it or using it. Sketchy basically does what it says; it creates sketches which are visual mnemonics for important things you need to remember. Most of these sketches are a story, some are an interesting scene, others are catchy visuals. The point of Sketchy is to have you recall the picture and then based on the picture, recall the details about the bacteria. It’s very very helpful, although some videos need to be watched several times because of the sheer amount of information compressed into a single panel drawing. Anki. Once again, I cannot stress this enough. Anki not only saves trees by putting an end to paper flashcards, it also puts an end to time spent making the flashcards in the first place in more ways than one. There are pre-made Anki decks out there that are absolutely amazing. My personal favorite is Zanki because the flashcards are all made from First Aid and Sketchy. So if you have done those two resources, Zanki becomes more of a regular revision flashcard session, instead of a memorization session. With t he regularly paced card repeats, it’s pretty easy to hammer in and consolidate important information for quick recall. The first few months of Microbiology, I had no idea what was happening. There were so many bizarre bugs with their strange names and their diseases and toxins, that it was all getting pretty mixed up in my head. That’s when I noticed a pattern, a pattern confirmed by Kaplan. When it comes to bacteria, there are a couple of headings that you should know about them. What kind of bacteria is it? How does the disease present? Of course, each question has it’s further subheading. For example, “how does the disease present” can also include the prognosis and complications of the disease. This is how you can get specific bugs down, but what about some of the general stuff? Like the differences between gram positive and gram negative? And all the types of toxins? What about shift and drift? Well, my dear friend, these concepts cannot be as neatly handled as bugs, mostly because these are concepts and not facts that need to be known. If you’re having trouble in that department, you may refer to watching the Kaplan microbiology lectures. However, I personally have not been able to watch them (I have a fantastic talent of waking up as soon as the video ends) but I’ve heard they’re pretty good and can help clarify these concepts. Watching videos for each individual bug is a waste and only Sketchy micro should be used for that. In my school, we studied microbiology by presentation. For example, if we were currently on a neuroscience module, we would cover all of the bacteria, viruses, fungi, etc that could cause CNS infections. Instead of bugs being classed by their properties, they were classed by their diseases. Of course some bugs popped up quite a few times but it was nice to see a familiar face every now and then. 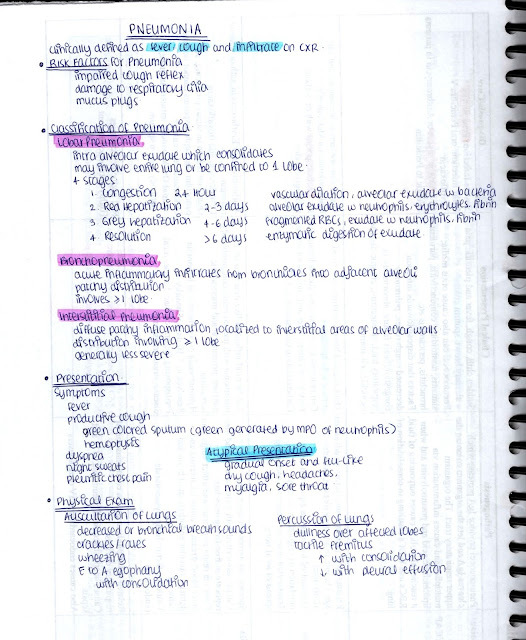 While studying these various bugs, I decided to create my own notes. At first, I wrote them down on paper, but as bugs repeated and the modules went on, I found that I had to add a lot of things to my notes, which is pretty hard to do if you’re working on paper and pen. I decided to switch over to typing my notes and editing them as the time came. Even though writing notes on a laptop is much easier and arguably faster, especially when it comes to simply filling out a table, I don’t like studying on a screen if I can help it. The itch to highlight and underline is too strong. As a result, when I finally finished editing all of my notes, I printed them out and stuck them into my First Aid (in the microbiology section, not the organ systems section). It’s been working out pretty well for me! I printed most of the notes on a single side so I could use the blank pages for more notes. If you guys are interested, I could share the PDFs of my typed notes. Of course, there are a few typos that I picked after printing, so I would have to fix those. Let me know if it interests you and I’ll get to work preparing them. They’re really helpful, to the point and are clinically useful since they’re grouped according to system and presentation. You can print them and also put them into your First Aid. I edited the tables to make sure they fit into the size of the pages of First Aid so that means on a regular A4 paper, there are pretty big margins. Did you find this post helpful? Don’t forget to share it! UPDATE: PDF notes will be emailed out soon! If you want to get your hands on them, subscribe to my email list so these notes land straight into your inbox. Click here to subscribe! Thanks! This was really helpful (even if it wasn't about roaches) because I'm going to start revising infectious diseases again and it's scaring me so much lol. Would love it if you could share the PDF! Thanks – this post is great! Gave me some hints on how to tackle the subject! 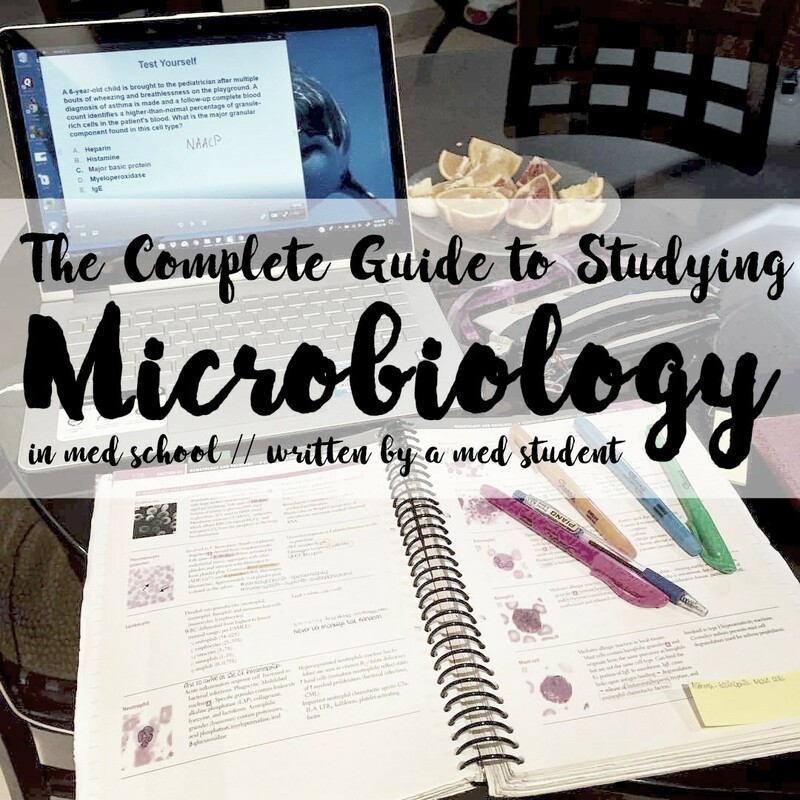 I’m about to take Microbiology final and would really love if you shared the PDF of your notes! Hey thanks for the help! thanks this looks really helpful. 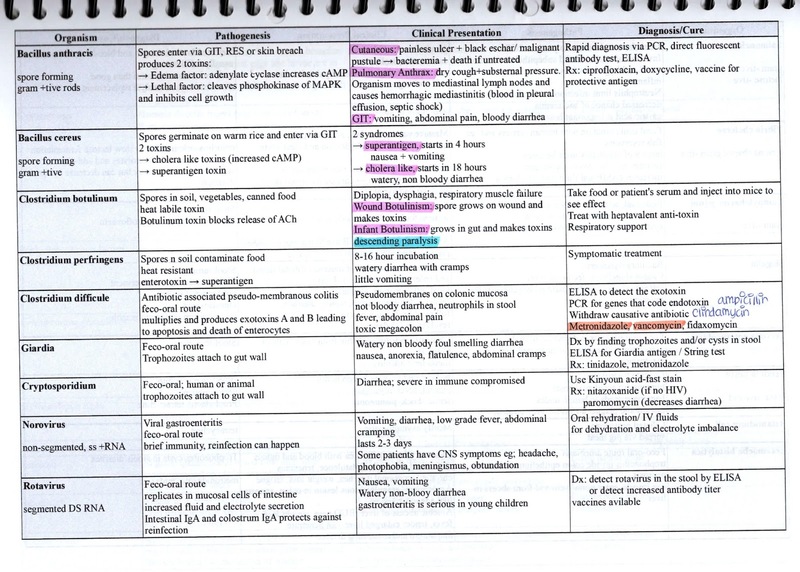 could you email me the pdf of your typed notes and the rest of the pictures for the bacterial table content. Will you please send me the pdf file for microbiology? ?